David Hicks’ Guantanomo Bay imprisonment found wrongful but Brandis in no hurry to apologise or stop beating the terror drum. “Hey, my name is David Hicks,” he shouted, as Senator Brandis wrapped up his address at a Human Rights Awards function. Attorney-General George Brandis plumped himself expectantly before an ABC News 24 camera in Canberra late last week. Brandis, a former trade practices lawyer, as pallid as an undead vampire, appeared like some portly nocturnal creature who had strayed somehow uncomfortably into daylight. Brandis frowned, blinked myopically and peered about. The afternoon sun fell mercilessly on his pale bald pate. Was he expecting someone or just looking for the camera? Was David Hicks’ challenge ringing in his small but perfectly formed ears? Or was it tinnitus? Off camera someone was giving instructions which Brandis was having trouble following. Where to stand, perhaps. 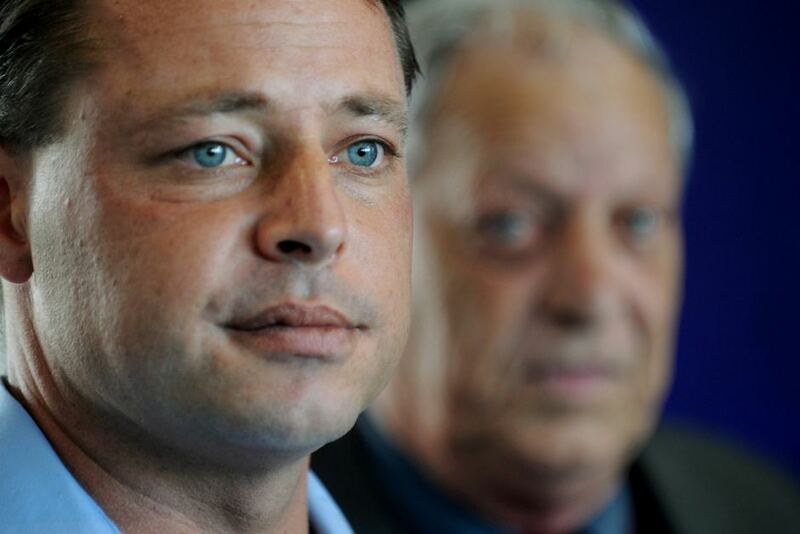 The United States had just agreed David Hicks’ innocence after years of wrongful imprisonment in Guantanomo Bay. Viewers naturally expected Brandis had called the conference to apologise to Hicks. His conscience, we just assumed, had got the better of him. Obama had surely had a word. Now Brandis would step up to the plate and deliver a public apology. Others had been calling for one. Hicks’ lawyer Stephen Kenny said his client David Hicks was looking forward to having his name cleared and deserved an apology from the Australian government. Mr Kenny hoped the Australian Government would apologise for its part in Mr Hicks’s treatment. “I think their support of holding David in Guantanamo Bay in those conditions for so long is a severe embarrassment and he at least deserves an apology from those who were involved,” he said. Anticipation was mounting. Brandis would announce that he was sorry and then, we guessed, announce that his government had set up a compensation package for Hicks to make up for the suffering it had caused an innocent man. Surely, given its liability, the government would make a belated attempt at restitution and reparation for the damage and suffering caused to Hicks and his family. A package must surely be in the offing. This would include a substantial consideration for damage caused to their reputations as a result of the Australian government’s support of his five and a half years of wrongful imprisonment and torture in Guantanomo Bay by the United States of America. There could even be specific reference to an out of court settlement for damage and loss caused by the George Brandis’ own libellous comments. Gerard Henderson would then surely follow. But, no, our hopes and expectations were dashed. Brandis opened his mouth only to waste everyone’s time with another dull diatribe against home-grown Jihadists who went to fight for ISIS. Perhaps we expected too much. Perhaps it was unreasonable to expect accountability or moral propriety from this man in pin stripes blinking in the Canberra sun or his government on their maltreatment and abandonment of Hicks. Perhaps it was a bridge too far, on a par with expecting Brandis to renounce his membership of the elitist, Bohemian, male-only Melbourne Savage Club with its guttural noises, chest-beating and other male bonding rituals. Logically, this is not too much to expect. The Savage Club’s pledge to free-love, frugality and voluntary poverty, required of all members is a poor fit for Brandis, a fine dining voluptuary keenly working his way through a hefty smorgasbord of entitlement, assisted by Australian taxpayers who have invested heavily extra thousands in the senator’s hospitality, wine bill, custom-made bookshelves, his library and his many other perks of office. Why, a modest dining out, a meal with a special guest or two could cost over a thousand dollars. Then was the drinks bill after. Brandis bumbled through a script about how the whole Australian nation must quake in its beds over the real risks of foreign fighters and how many there were and a lot of other scare-mongering of a similar nature, all without any evidence whatsoever. The Attorney-General aired yet again the absurd Abbott government argument that legions of Australian foreign fighters are in fact a real and present danger to anyone at home. You can hear the same scenario from David Cameron and other self-styled defenders of freedom who sing from the same song book. Brandis, who resembles Mr Magoo more than any lynx eyed legal beagle or even any Attorney General, appeared discombobulated, asking which way he should be facing whilst making odd shuffling and turning movements like a male emperor penguin who has been given an egg to incubate. It didn’t put him off his autocue, however. He was getting the message out. He even waved to someone off camera in that disconcertingly matey way favoured by so many deluded self-alienating others of his political persuasion. No-one was observed waving back. Attorney-General Brandis claimed grandly ‘the total number of Australians thought to be involved in the conflict was now around 90, up from roughly 75 late last year,’ No evidence was given. Nor would evidence ever be forthcoming. National security legislation made such matters off limits to mere citizens. The charade that took place at Guantanamo Bay would have done Stalin’s show trials’ proud. First there was indefinite detention without charge. Then there was the torture; however the Bush lawyers, including his Attorney-General, might choose to describe it. Then there was the extorted confession of guilt. Whatever Hicks may have done, the theatre of a voluntary plea of guilty when the choice is “rot in hell or say it’s true so you can go home” is worthy of The Grand Inquisitor. In Stalin’s as well as the German show trials of the 1930s, the essence of the display was the public confession, followed by the sentence. Details of the offence, of course, were crafted carefully by authorities to fit the current climate of fear-mongering and witch-hunting. And last week, Brandis was cranking the propaganda handle of the state’s fear machine. Warming to his theme, Senator Brandis claimed intelligence agencies had noticed the “disturbing” demographic shift in the last six months. No-one present appeared remotely disturbed but our intelligence agencies are well-placed and well-paid to be disturbed on the nation’s behalf and we can expect George Brandis and the entire Abbott cabinet to bring this disturbance to our notice. “More and more very young people are … being enticed and ensnared here in Australia with the false glamour of participating in the civil war on behalf of ISIL, or DAESH,” Brandis said hoping no-one would notice the parallel with members of the Australian armed forces whose numbers were soon to be increased by a Prime Minister seeking false glamour to boost his standing in the polls, a Prime Minister who is happy to pretend to the nation that we are supporting an Iraqi government at its request instead of following the US and in the process causing further grief and mischief by propping up a corrupt dictatorship with its own terror squads which inflict barbaric and brutal summary executions on innocent Iraqi civilians who happen to belong to be Sunni rather than Shia. Fondly savouring his use of DAESH, because ISIS finds the term derogatory, Brandis’ acronym invokes ad-Dawlah al-Islāmīyah fil ‘Irāq wa ash-Shām a phrase which means The Islamic State in Iraq and Greater Syria. Brandis was merely following his leader, Tony Abbott, who prefers a similar disdain for any nuanced appreciation of the conflict in Iraq. Neither man appears to give a fig for the consequences despite both being keen to impress upon us the dangers we face from ISIS followers and would-be followers in our midst. “DAESH hates being referred to by this term, and what they don’t like has an instinctive ­appeal to me,” Abbott said with relish in name-calling and a typical eagerness to give offence despite a situation urging caution. ISIS supporters take offence because DAESH crucially omits the Islamic portion of the name. According to The Guardian’s Ian Black, DAESH “entered the ever-adaptive Arabic language big time: in the plural form — ‘daw’aish’ — it means bigots who impose their views on others.” ISIS leaders have threatened “to cut out the tongues” of anyone caught using the term DAESH. Our own champion of 18C bigotry, Brandis’ appearance was also a classic in its own right, a highlight of the ABC News 24 chook-feeding news release. This ‘news’ looks increasingly like a propaganda session. Typically a government politician appears before a gathering of cameras to read his spiel and then pretends to answer inaudible questions. Sometimes we can faintly hear ‘reporters’ asking their questions. This gives the whole media release circus an additional absurdist twist as if the politician is talking to himself or herself in public (again). It also adds an extra level of incoherence to Brandis’ natural, halting delivery. What is not absurd is how suppressing any comment or question or any real context favours propaganda and deviates from any responsibility to inform objectively. Of course, the trend towards a lack of audible questions in press releases and media briefings could simply be due to technical bungling or even ABC cutbacks but it needs to stop. The public has a right to know the truth. Brandis blinking in the sun, an Attorney General briefing Australians on matters thought to be rather than known to be; assertions without evidence or explanation represents a government intent on feeding our fears whilst side-stepping its duty to inform; evading questions, shrugging aside responsibility, rationality and moral accountability. Denying David Hicks an apology or putting an apology on hold helps maintain the myth of the enemy of the state, a convenient construct to permit new laws, increased security and secrecy which effectively take all of us prisoner. « We must close our Pacific gulag on Manus Island.